First Line: Desperate times call for desperate measures. Moonlighting in a pet shop to make ends meet wasn't exactly in Tobi Tobias's plans when she opened her own ad agency, but there may be a light at the end of her tunnel. She's just been given her first big break. Zander Closet Company needs a catchy campaign slogan pronto, and Tobi thinks she's come up with a winner: "When we're done, even your skeletons will have a place." Unfortunately, there is such a thing as bad publicity when a dead body falls out of one of Zander's showcase closets. Now Tobi has to save her business, but the only witness to the murder is a stressed-out parrot. As first investigations go, Tobi has her work cut out for her. Laura Bradford's new series set in St. Louis comes out of the gate strong. Animal lovers are going to enjoy the pet shop angle, and lovers of wit and words are going to enjoy the ad slogans Tobi comes up with. Fans of good mysteries are going to be tickled pink, too. 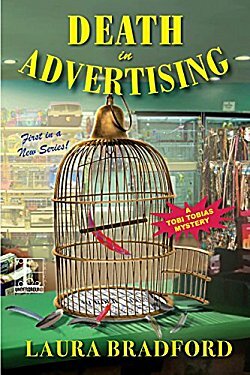 The mystery in Death in Advertising is a good one-- I didn't have it figured out, but once the killer was revealed, I could see the trail of breadcrumbs that had been left for everyone to follow. As with all good cozy series, the cast is the most important thing and these characters shine. I really liked Tobi's voice, even though I wasn't enamored of her slogan for the closet company. She's just the sort of character readers would choose as a friend. Smart, funny, compassionate, willing to help, and she has an excellent support system. Lumps or no, Bradford's first Tobi Tobias mystery is a winner, and I'm certainly looking forward to book two. I like the sound of this one, Cathy. I always respect it when the author provides a challenging mystery as well as solid characters. Interesting context, too. Glad you enjoyed it. I'm really looking forward to the next book!